Jio OnePlus Offer, Jio Karbonn Offer, Karbonn OnePlus Jio Offer, Free Jio 4G Data in OnePlus and Karbonn Mobile, Jio Additional Data Offer For Karbonn & OnePlus Smartphone, Get Upto 60GB/25GB Extra Data in OnePlus and Karbonn Mobile – Jio is back with another offer in which you will get FREE 4GB Jio Extra Data on Every Recharge. We already shared Jio Xiaomi Offer, Jio Samsung Offer. Now i am going to share offer on OnePlus & Karbonn Smartphone. Jio is present offer on OnePlus & Karbonn Mobile Phones. 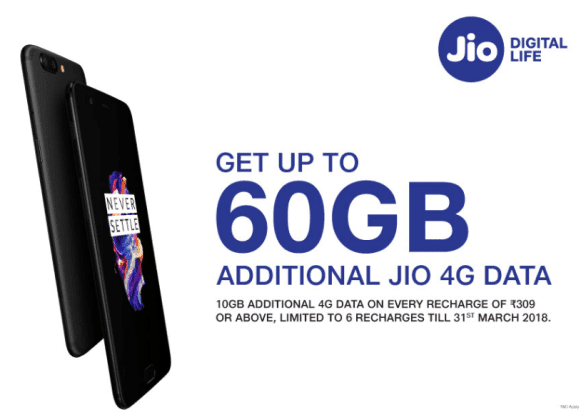 You will get FREE Upto 60GB/24GB Jio 4G Extra Data on Every Jio Recharge. This offer is applicable only for OnePlus & Karbonn Smartphone users. This is Jio OnePlus & Karbonn Offer. You will get FREE 10GB Extra Data on Every Recharge of Rs.309 or more, you can avail this offer 6 times. This is awesome offer. So hurry up and enjoy this amazing Jio OnePlus & Karbonn Offer. If you are the OnePlus users and want to get FREE 10GB Extra 4G Data, Then you have to Initiate Recharge of Rs.309 or more and Get Extra 10GB. If you are the Karbonn users and want to get FREE 5GB Extra 4G Data, Then you have to Initiate Recharge of Rs.309 or more and Get Extra 5GB. Initiate Recharge of Rs.309 or more. You will get the Free 10GB/5GB 4G Data Coupon. You Will see the the Additional Data Voucher under the My Plans section. You can avail Rs.309 Recharge offer 6 Times. 1) A40 Indian, 2) A41 Power, 3) K9 Smart Yuva, 4) Aura Power 4G, 5) Aura Sleek 4G, 6) Aura 4G, 7) K9 Smart 4G, 8) K9 Viraat 4G, 9) Aura Note 4G, 10) Aura Note 2, 11) Aura Note Play, 12) Aura Power 4G Plus, 13) K9 Kavach 14) Titanium Vista 4G. “Eligible Device” shall mean the mobile devices of United Telelinks (Bangalore) Limited (“Karbonn”) brand viz a) A40 Indian, (b) A41 Power, (c) K9 Smart Yuva, (d) Aura Power 4G, (e) Aura Sleek 4G, (f) Aura 4G, (g) K9 Smart 4G, (h) K9 Viraat 4G, (i) Aura Note 4G, (j) Aura Note 2, (k) Aura Note Play, (l) Aura Power 4G Plus, (m) K9 Kavach (n) Titanium Vista 4G, where the services of RJIO are activated for the first time, on or after August 18th, 2017. “Eligible Subscriber” shall mean and include a person who purchases Eligible Device and who is an active subscriber of the RJIO connection (existing or new) and is enrolled in the “Jio Prime” membership plan. “Entitlement Period” shall mean the period between August 18th, 2017 and March 31st, 2018. “Offer Benefits” shall mean the benefits accruing to the Eligible Subscriber under the Offer as shown hereinbelow.